Home / General / What happens to your body when you stop smoking? To stop smoking is one of the most difficult challenges to overcome. You may have stopped smoking for six years and one pull on a cigarette, just for fun, could cause you to start smoking again. Hopefully you have already experienced the benefits of not smoking first-hand or perhaps you now have to stop on doctor’s orders. Whatever the reason – it’s better to not smoke at all. The global tobacco epidemic causes the death of almost 6 million people every year. More than 600 000 of these are non-smokers who die due to passive smoking. The list of health problems connected to smoking cigarettes is endless and includes cancer, lung diseases, heart attacks, stroke, blindness, fertility problems and various other issues. The good news is that it is never too late to stop smoking and the minute you stop, your body starts to recover. Approximately 20 minutes after smoking your last cigarette, your blood pressure falls to a normal level. Your blood circulation and lung capacity will improve. 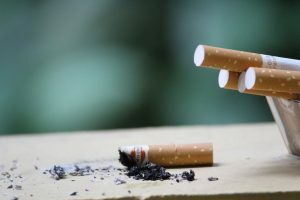 “Smoking suppresses some functions of the lungs and when you stop smoking, your lungs will become over-active,” warns Dr. Vorster, pulmonologist at Mediclinic Panorama. Some people cough more than others and have more discharge in their lungs after they have stopped smoking. You will therefore feel worse in the beginning than when you were still smoking. Your coughing will abate gradually and your shortness of breath will be something of the past. Your sense of taste and smell will improve. The cilia in your lungs will start functioning normally and help clear up your lungs. A year after you have stopped smoking, your risk of coronary heart diseases will be of half that of a smoker. Five years after you have stopped smoking, your risk of cancer of the mouth, oesophagus and bladder will have decreased by half. Your risk of cervical cancer will be equal to that of a non-smoker. After two to five years your risk of having a stroke will be equal to that of a non-smoker. Ten years after having stopped smoking, your risk of dying of lung cancer will be half of that of a smoker. The risk of cancer of the larynx and pancreas also decreases. After 15 years your risk of contracting coronary heart diseases will be equal to that of a non-smoker. The ageing process will also slow down. Decide on a date to stop smoking and keep to it. Throw away everything that reminds you of smoking, including cigarette packets, ashtrays and lighters. Drink a lot of water – it will help flush the nicotine from your body. Become more active. Exercise regularly, start walking or jogging. Change your routine. Avoid other smokers for the first few days, or things that tempt you to smoke. Inform your family and friends that you are trying to stop smoking, so that they can support you. After you have stopped smoking, you might become light-headed of experience light headaches. This is normal and should improve after a day or two. If you are afraid of gaining weight, eat with regular intervals during the day and make time for exercise. Not all former smokers gain weight. There are many ways to stop smoking. Enquire about alternative treatments such as acupuncture, hypnosis and homeopathy. Some people use nicotine substitutes such as stickers, a spray or chewing gum.